Host of EWTN’s “Deep Adventure Radio,” and two-time Masters World Champion Surfer, Bear Woznick is the Adventure Guide for Deep Adventure Quest Retreats, where people step out of their comfort zone and into the danger zone of God’s will. 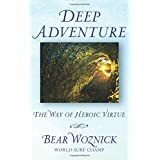 In Deep Adventure: The Way of Heroic Virtue, Bear shares his real-life adventures as a way to challenge you to go deeper with God and live a life of virtue. Pulse-pounding stories of ocean rescues, huge waves and deadly encounters with sharks show us that when people abandon themselves to God, they do not become some soft, pastel version of themselves. On the contrary, a life lived in pursuit of God’s will is the boldest, most rewarding way possible to live. If you’re tired of being spoon-fed the message that you just need to be “nicer,” this book is for you.